Ring & Sing Praise, vol. 1 arranged by Douglas E. Wagner and Douglas Wagner. For handbell choir (3-5 octaves) with optional SATB choir. This edition: Complete. Contemporary, Hymntune, Praise, Sacred. Grade 2+. Collection. 30 pages. 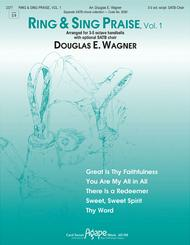 Published by Hope Publishing Company (HP.2377).Five well-known contemporary songs are collected here in two volumes, one for SATB vocal choir and one for 3-5 octave handbell choir. The choral settings can be accompanied by keyboard or handbells, using the bell book. The bell settings are levels 2-3 and can also be performed alone without the vocal choir.